*As publicists for +LIVE+, we wanted to ensure you received today’s announcement. 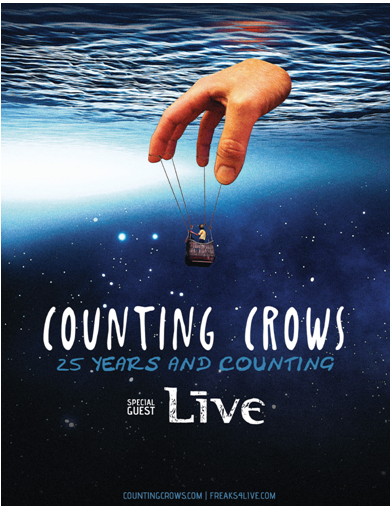 (April 2, 2018) – After more than two decades and 20 million albums sold globally, Counting Crows will celebrate 25 years of making music by hitting the road for a worldwide “25 YEARS AND COUNTING” tour, starting with a 40+ city trek across North America this summer. Presented by Live Nation, the tour will begin June 27 in Boise, ID and travel across cities such as San Diego, Las Vegas, Denver, Atlanta, Tampa, New York, Boston, Toronto and Chicago before concluding September 22 in Nashville, TN. Joining the tour is multi-platinum band +LIVE+. Tickets for the tour will go on sale to the general public in select cities starting Friday, April 6 at 10am local time. Counting Crows and +LIVE+ fan presales will begin tomorrow, April 3 at 10am local time. Please see below for full tour itinerary and visit www.livenation.com for full details. This entry was posted in LIVE, Press Releases. Bookmark the permalink.